This set of C Multiple Choice Questions & Answers (MCQs) focuses on “Recursion”. Explanation: The above code returns the factorial of a given number using the method of recursion. The given number is 4 in the above code, hence the factorial of 4, that is, 24 will be returned. Explanation: The compiler uses the data type stack for implementing normal as well as recursive function calls. Explanation: A stack is a last in first out(LIFO) data type. This means that the last item to get stored in the stack is the first item to get out of it. Explanation: When a recursive function is called in the absence of a exit condition, it results in an infinite loop due to which the stack keeps getting filled(stack overflow). This results in a run time error. When x=6: ‘+’ is printed. When x=5: ‘+’ is printed. When x=4: ‘+’ is printed. When x=3: ‘+’ is printed. When x=2: 2 is printed. Hence the output is: ++++2. 6. How many times is ‘a’ printed when the code given below is executed? Explanation: Although we have specified the exit condition, the code above results in an infinite loop because we have used b- -(decrement operator) to call the recursive function. Due to this, the loop goes on infinitely. However, if we had used f1(b-1) instead, the answer would have been 10 times. Explanation: The recursive function returns n+f(n-2) till 10>0. Therefore, the above code will be evaluated as: 10+8+6+4+2, which is equal to 30. 8. What happens when the code shown below is executed? Explanation: in the above code, we are calling main() from main(), which is recursion. However, we have not defined any condition for the program to exit. Hence, “hello” will be printed infinite number of times. To prevent this, we need to define a proper exit condition in the recursive function. 9. 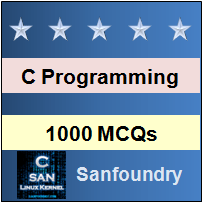 If the input given to the code shown below is “sanfoundry”, then which of the following will be the output? Explanation: The above code prints the reverse of the word entered. The recursive function terminates when getchar() is equal to null. 10. Iteration requires more system memory than recursion. Explanation: Recursion requires more system memory than iteration due to the maintenance of stack.